The Holy Grail for many investors has been to have their investments generate income while still achieving principal growth with enough stability to keep panic at bay when the market is turbulent. Surely today’s low yield environment makes this desire seem out of reach. Yet, current times leave investors and their advisors even more desirous of such outcomes. Defined contribution plans have replaced defined benefit plans for all but a few, leaving individuals more reliant on their own thrift and good investment choices. Living longer with more years in our retirement amplifies the impact of our investment choices. And the safety net of social security shows signs of fraying, making the prudent person wary of reliance. Clearly, the stakes are higher than ever for both retirees and those who hope to retire one day. We plan to outline an approach that may effectively deliver these three desirable characteristics: income, growth, and stability. Let’s first start with a little history. For decades, utility stocks were the standard answer to this perennial challenge. It was for good reason that advisors traditionally put ‘widows and orphans’ and other conservative investors’ savings into utility stocks: they produced income plus modest real principal growth with the relative stability that came with regulated industries. These included electric, gas and water utilities, as well as telephones in the days of the AT&T monopoly3. Although US Government and AAA Corporate Bonds also offered income and nominal safety, the higher risk of utility stocks compared with bonds was deemed to be worth bearing, since bonds could not match utilities’ principal growth and protection from inflation. To see the sensibleness of this investment approach in its day, we look at the period of 1946 through 1992. During that period the volatility of utilities was about 80% that of the S&P 500 Index, with a 1.24% higher average dividend yield, and a cost of just 1.68% less annualized capital appreciation. While an alternative choice, investing in long-term government bonds, yielded 0.70% more on average and offered substantially lower volatility, it came at a cost of 4.03%4 less capital appreciation. With these results, the fact that utilities were the go-to sector for conservative investors should come as no surprise. But utilities were not immune to the reality that industries and markets can experience significant disruption. In this case, de-regulation opened the door to changes that fundamentally altered the nature of utility stocks6. Seeking a better return on investment, utility companies’ management took advantage of deregulation by “diworsifying” into unrelated businesses; examples include Southern California Gas with Thrifty Drug Stores and Arizona Public Service with Mera Bank. While not all diversification turned out badly, the utilities sector was no longer a pure play on a regulated industry, but rather a mix of the regulated (transmission) and the unregulated (generators), of the diversified and the not. This invited market speculation as some utilities pursued returns more aggressively, including, according to Fortune magazine, "America's Most Innovative Company", i.e., Enron7. Nowadays, investors have to be more enterprising to get income plus growth with relative stability. The attributes investors liked in regulated utilities still exist, though not all utilities have these characteristics today, and not all stocks with these characteristics are utilities. We can systematically seek out the stocks with lower volatility and higher dividend yield in any market sector, and with them build a broader, more diversified portfolio that explicitly focuses on the tried and true benefits of lower volatility and higher dividend stocks. The combination of lower volatility and higher dividend yield is far more powerful than either attribute alone, and produces a distinct investment strategy, much as blue and yellow produce the distinct color green. By combining these characteristics, we can mitigate or even avoid the pitfalls of each when used individually. For example, emphasizing high dividend yields effectively excludes any low volatility stocks that are fundamentally expensive. Let’s get into the specifics of how we design a portfolio to have the performance characteristics that never go out of style. First, for each of the largest 3,000 U.S. stocks, we calculate a composite “stable yield” score; we adjust downwards the yield of stocks with relatively higher price volatility and earnings volatility and adjust upwards the yield of stocks with relatively lower price volatility and earnings volatility. Then we exclude any stocks whose dividends are not supported by earnings. Finally, we construct the portfolio that maximizes this composite stable yield score, given the following constraints: 25% sector concentration limits, 15% maximum weight to REITs, and 2.5% or less (liquidity-based) holding limits on individual stocks8. 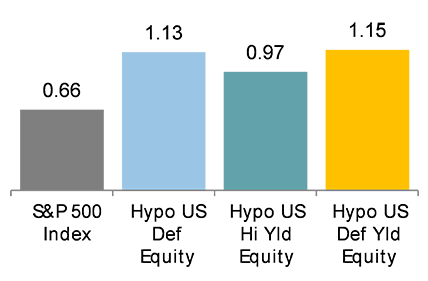 The portfolio is rebalanced quarterly, and the resulting US Defensive Yield equity returns (Hypo US Def Yld Equity) are adjusted to reflect estimated transaction costs, but not management fees9. So let’s walk this portfolio -- of high yield and low volatility stocks, constrained to meet prudent diversification and liquidity criteria -- down the runway and see how it might have performed. 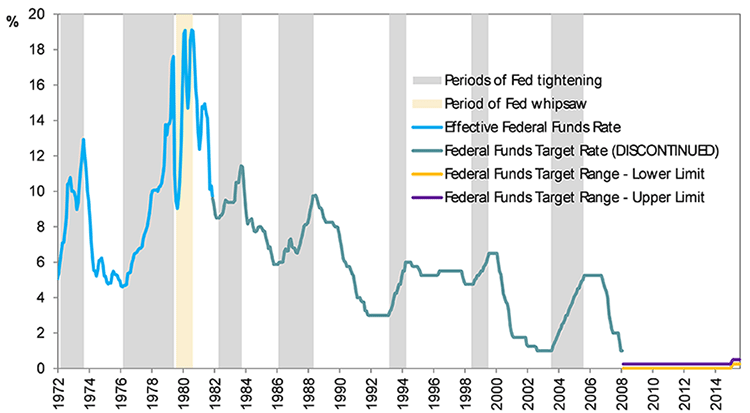 The first Hypothetical US Defensive Yield portfolio is formed at the end of January 1973. For comparison, we also construct single characteristic portfolios, one for high dividend yield (Hypo US Hi Yld Equity) and one for low price volatility (Hypo US Def Equity), otherwise following the same procedure and constraints as above. Throughout the next 42 years, its dividend yield is consistently higher than the S&P 500 Index and its volatility is consistently lower. Average annual 1-way turnover was just under 50% from 1973 through 2015. 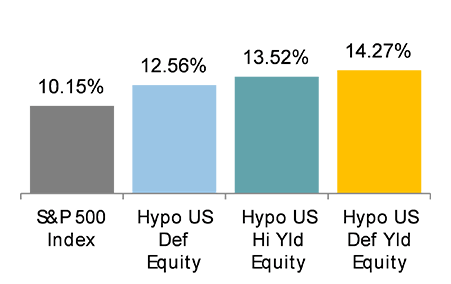 The defensive equity portfolio’s combination of low volatility with high yield captures most of the downside protection associated with defensive equities, and most of the yield pick-up associated with high yield. Up capture measures the percentage of market gains captured by a manager when markets are up. Down capture measures the percentage of market losses endured by a manager when markets are down. 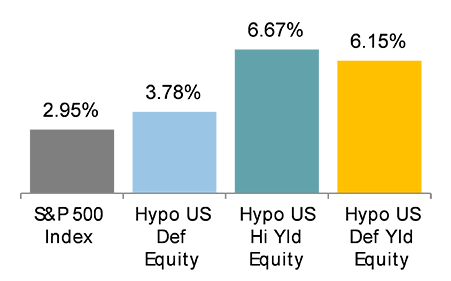 Overall, the Hypothetical US Defensive Yield Equity portfolio delivers performance characteristics superior to all three comparison portfolios: higher annualized return, better return vs risk, and stronger return vs drawdown. Due to the defensive nature of the strategy, major declines tend to be less severe than for the S&P 500 Index, and recoveries tend to be quicker, particularly if there is a flight to safety (Figure 3). All performance is gross of fees and does not reflect the deduction of investment management fees. If such fees were deducted, the results would be lower. Please see Important Information on Hypothetical Performance in the Appendix. Even classic styles are not always suitable for everyone. Portfolios designed to provide yield are obviously attractive for those seeking income to spend; but what about the savers? Is this design suitable for those still in the accumulation phase of their lives? In this section we will characterize risk and return under two different assumptions: that dividends are reinvested (the savers), and that dividends are spent, so capital appreciation only (the spenders). Looking at the results in (Figure 4), we see that both savers and spenders do better investing in defensive equities with higher dividends versus the S&P 500 Index. When dividends are reinvested, not only is risk lower, but total annualized returns are higher. Alternatively, when dividends are removed, the relevant measures for the spenders, capital appreciation and average yield, are also superior10. Let’s look a little more deeply at the potential results for our savers investing in defensive yield equities. Imagine a newly minted, 22 year old college grad, having landed his first job, making a new year’s resolution for 1973 to skip his morning coffee and donut (the equivalent of $4/day in today’s prices) and instead, invest the money at the end of each month in a nontaxable account. He sticks with it until December 2015, when he decides to retire at age 65. After contributing a total of $62,820 over 43 years, he would have $417,106 if he had invested in the S&P 500 index. If he had been able to invest in the Hypothetical US Defensive Yield Equity strategy instead, he would have $1,052,068, 2.5X as much. Let’s not ignore our spenders who are looking for dividends to supplement their income. Here we imagine three investors each putting the equivalent of $10,000 today into a two-asset (stock/bond) portfolio at the end of January 1973. All three go to their investment advisor to determine their appropriate asset allocation. Investor 1 tells her advisor her need for income and something about her risk tolerance. Her advisor recommends a traditional 60/40 portfolio made up of an S&P 500 Index and Long-Term Government Bonds, respectively. Investors 2 and 3 both use another advisor, who delves into their need for income, capital appreciation, interest rate sensitivity and downside risk tolerance. This advisor recommends using Intermediate Term Government Bonds and US Defensive Yield Equities as fulfillment vehicles , and then recommends a 60/40 portfolio for risk averse Investor 2 and an 80/20 allocation for Investor 3, who will need more portfolio growth to sustain a long retirement. In all three cases dividends are not reinvested, no other additions are made to the portfolio and the portfolio is rebalanced to its policy mix at the end of every year. We track their income and capital balance below. All historical values are rescaled according to the Consumer Price Index (CPI) so that constant $ values are shown (Figure 6). Investor 2’s 60/40 Hypothetical US Defensive Yield Equity /Intermediate Bond portfolio outperforms Investor 1’s more traditional 60/40 mix of S&P 500 and Long-term Government Bonds, providing more income generation, and similar capital appreciation – sometimes a little better, sometimes a little worse— despite lower risk. Investor 3’s 80/20 mix of Hypothetical US Defensive Yield Equity and Intermediate Bonds handily outperforms Investor 1’s more traditional mix, providing both more income generation and more capital appreciation, without taking on higher risk. QS Investors and Morningstar (Ibbotson data). All performance is gross of fees and does not reflect the deduction of investment management fees. If such fees were deducted, the results would be lower. Now, let’s take a look at the toolkit the second advisor uses when making her recommendations. Replacing the S&P 500 Index with Hypothetical US Defensive Yield Equities, which has higher returns and lower risk than the S&P 500 Index, she was not surprised to see the results: a 60/40 portfolio with higher returns and lower risk, both desirable outcomes for her more conservative saver clients. (Refer to the orange frontier in Figure 7). For her clients who are concerned about interest rate risk (and who isn’t with current rates so low? 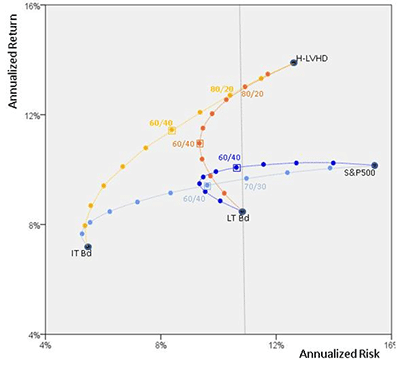 ), she looked at what happens when long-term bonds (LT Bd) are replaced with intermediate term bonds (IT Bd), and found that much lower levels of total risk are achievable, with a small haircut to returns. (Refer to light blue frontier in Figure 7). 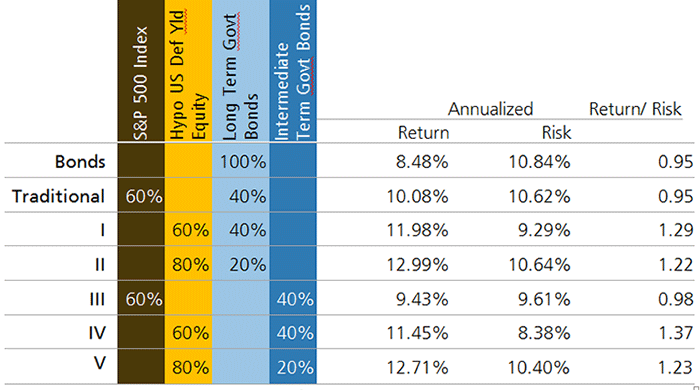 Equity and Bond mixes: Hypothetical US Defensive Yield Equity, S&P 500 Index, Long-term Government Bonds (LT Bd) and Intermediate-term Government Bonds (IT Bd), with reinvested income. Source: QS Investors and Morningstar (Ibbotson data). See Appendix A for returns table; Please see Important Information on Hypothetical Performance in the Appendix. 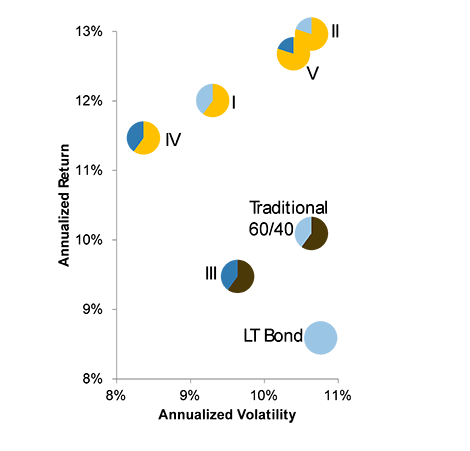 Blending Hypothetical US Defensive Yield Equities and intermediate bonds gives the best frontier, with the highest return at each level of risk, shown in yellow in Figure 7. 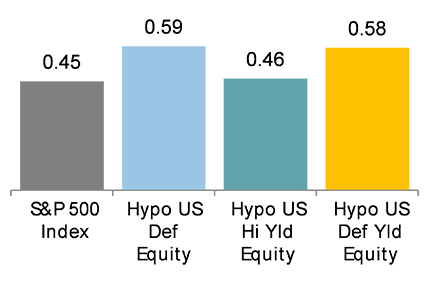 The 60/40 Hypo US Def Yld Eq / IT Bd mix gives higher returns with lower risk, for a Sharpe Ratio more than 40% higher than for the 60/40 S&P / LT Bd mix. Moreover, for the same level of total portfolio risk as a traditional 60/40 S&P / LT Bd mix, there can be a larger allocation to Defensive Yield Equities, of 80%. And that higher equity allocation again pays off in far higher return for that same level of risk. Conventional wisdom suggests utilities and other high yielding stocks are especially hard hit when bond yields rise. With bond yields near secular lows, it is therefore wise to consider what may happen when yields start climbing. We find that the combination of low volatility with high yield holds up better during the periods of Fed tightening than the others. Source: QS Investors, Global Financial Data; All performance is gross of fees and does not reflect the deduction of investment management fees. If such fees were deducted, the results would be lower. Please see Important Information on Hypothetical Performance in the Appendix. For long-term return-maximizing investors, the strategy is better held in tax-free accounts, as its higher yield and higher turnover compared with an index fund can result in a higher annual tax bill. Income-maximizing investors investing in taxable accounts will want to have this strategy in a vehicle that can reduce its capital gains liability. Some commentators note the recent increase in popularity of smart beta strategies and warn that relative valuations have risen along with their popularity. The implication is that one shouldn’t expect them to perform well going forward as they are now ‘expensive’. It is certainly true that low volatility-only portfolios, for example, are no longer so cheap relative to a capitalization-weighted index. But cheapness is not what drives low volatility performance! Low volatility-only portfolios have been cheaper than the S&P 500 Index the vast majority of the last 42 years; despite this, they underperform the S&P 500 Index most of the time, because the S&P 500 Index tends to have positive performance, and the very nature of low volatility is to have lower capture of both the upside and the downside of market performance. Low beta, not valuation, is the key driver of low volatility portfolio returns. The beta of our Hypothetical US Defensive Yield Equity strategy to the S&P 500 Index is 0.65. Focusing on the monthly residual return, i.e. the monthly performance that is not explained by this low beta to the S&P 500 Index, we find that the difference in dividend yield explains about 1.4% of the variance in the residual (t-stat of 2.68), while the spread in book/price actually has a negative, though a highly insignificant, coefficient (t-stat of -0.12). Retirees need this kind of strategy more than ever, as they are living longer, are less likely to have a pension, and bond yields are at secular lows.14 And, it turns out, so do savers of any age, who can benefit from the higher total returns associated with higher yield stocks, as well as from the compounding benefits of lower volatility. Over the previous sections we have demonstrated the value of designing a strategy that blends high dividend stocks, supported by earnings, with low volatility. It has been shown to deliver both capital appreciation and income competitive with, or superior to, other reasonable alternatives. These results have come with more stability and attractive upside/downside capture. Further, we have shown how this strategy can be used to build portfolios that deliver what many clients want and need most. To those who are concerned that rising interest rates will diminish these results, we have shown that history does not bear this out. To those who are concerned that such a strategy may now be overvalued, we say that the benefit is driven by low beta, not valuation. Our one caveat is the following: for long-term return-maximizing investors, the strategy is better held in tax-free accounts, as its higher yield and higher turnover compared with an index fund can result in a higher annual tax bill. In taxable, income-generating accounts, holding this strategy as a vehicle that can reduce capital gains liability is advised. We at QS strongly believe that high yield, defensive equity strategies should be the core holding of today’s income oriented portfolio. Furthermore, we believe they should receive a meaningful allocation in both conservative and aggressive, savings-oriented non-taxable portfolios. 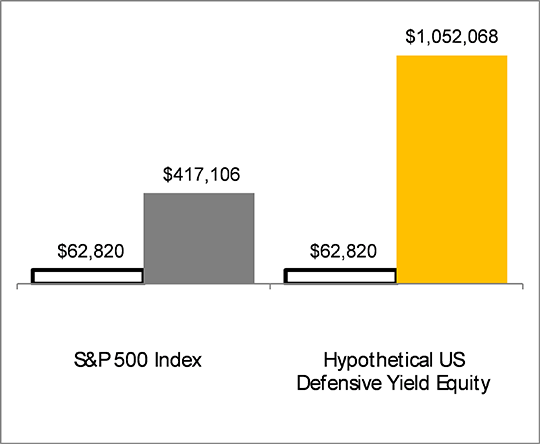 This whitepaper specifically discusses defensive yield investing in the equity space. It does not represent an actual product and may not be used in the offer of an actual product. Rosemary Macedo thanks Janet Campagna, Sanne deBoer, Josh Greco and Sarah Reifsteck for suggestions and supporting calculations. Please refer to the Appendices for Important Information regarding the views expressed in this paper as well as analysis based on simulated historical performance. Although the breakup created competition, AT&T continued to be perceived as a relatively safe investment until the late 1990s acquisition of TCI, as corporate strategy transitioned to the new market reality -- dotcom and “telco” (telephone+telecommunictions). 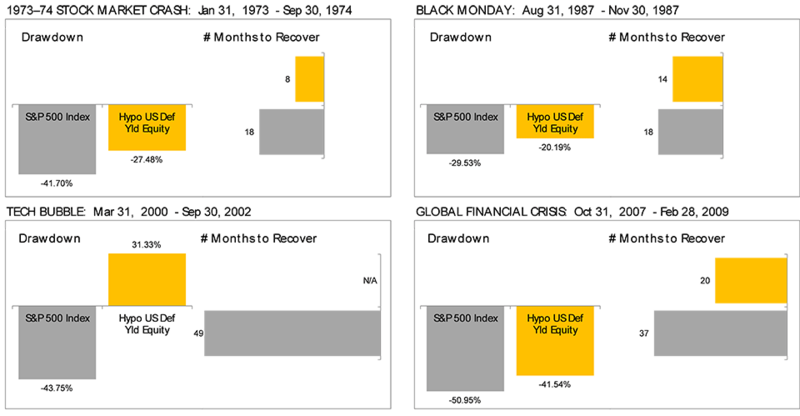 S&P 500 yield and price data from Global Financial Data, long term government bond data from Ibbotson. Fortune magazine named Enron "America's Most Innovative Company" for six consecutive years from 1996 to 2001. Research results relate only to a hypothetical model of past performance (i.e., a simulation) and not to an asset management product. All performance is gross of fees and does not reflect the deduction of investment management fees. If such fees were deducted, the results would be lower. Please see Important Information on Hypothetical Performance in the Appendix. Transaction costs were incorporated into the back-test and estimated based on turnover: starting in 1973, 45bps ramped down linearly to 15bps by end of 2001, remaining steady at 15bps to present date. The higher annualized capital appreciation for the Hypothetical US Defensive Yield Equity strategy is entirely due to the benefits of compounding lower volatility returns – the average monthly returns are slightly lower for Hypothetical US Defensive Yield Equity than for the S&P 500 Index. Source: QS Investors and Morningstar (Ibbotson data), respectively. All performance is gross of fees and does not reflect the deduction of investment management fees. If such fees were deducted, the results would be lower. Please see Important Information on Hypothetical Performance in the Appendix. Source: QS Investors and data from Morningstar (Ibbotson). The roots of utility de-regulation in the US start in the late 1970s, when utilities were expanding capacity even as demand was falling. This over-expansion caused debt burdens to balloon at a time of high interest rates while proposed rate increases were being denied. Amidst a worldwide atmosphere of deregulation, American utilities demanded change to how their industry was regulated and structured, including allowing them to diversify away from their core business. Years of legislative wrangling ensued, resulting in the Energy Policy Act of 1992, further wrangling, and, finally, the Energy Policy Act of 2005, which repealed the Public Utility Holding Company Act of 1935. This sector continues to evolve, and lately has been absorbed into a broader infrastructure theme, encompassing a wide range of tangible necessities (e.g., power, water, toll roads, airports) that tend to be regulated and offer some protection against inflation. As within the utilities sector, investors need to be selective regarding which companies are actually regulated, pure plays on the infrastructure theme, and which are not. The Hypothetical US Defensive Yield Equity Portfolio was created and is presented for purposes of product development. The simulation inception date is February 1, 1973. 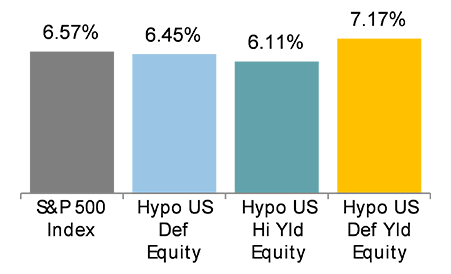 The Hypothetical US Defensive Yield Equity portfolio seeks to reflect the investment results of equity securities of U.S. companies with relatively high yield and low price and earnings volatility. The Hypothetical Portfolio is composed of stocks of U.S. companies across a wide range of market capitalizations. Returns from February 1, 1973 to November 2004 were calculated on April 18, 2016 using a universe of the largest 3,000 U.S. stocks by market capitalization and reconstituted annually in April. Returns from December 2004 to November 2015 were calculated on December 14, 2015 using the Solactive US Broad Market Index. December 2015 returns were calculated in January 2016 using the Solactive US Broad Market Index. The number of component securities in the hypothetical portfolio is expected to range from 50 to 100, with the exact number varying primarily based on market liquidity conditions at the time of its rebalances. Stocks whose yields are not supported by earnings are excluded from the Hypothetical Portfolio. The methodology calculates a composite “stable yield” score, with the yield of stocks with relatively higher price and/or earnings volatility adjusted downward and the yield of stocks with relatively lower price and/or earnings volatility adjusted upward. The Hypothetical Portfolio includes stocks with a high “stable yield” score, with weightings taking into account liquidity requirements and concentration limits on sector exposures and individual stock holdings. The Hypothetical Portfolio is reconstituted annually, with components reviewed on a quarterly basis for continued suitability. Current index constituents are reviewed to determine if any of them should be removed due to, among other considerations, changes to their predicted or past dividend payouts, predicted or realized earnings, current valuation, price volatility, as well as volumes traded. In addition, constituent weightings may be adjusted to avoid concentration in sector exposures or individual stock holdings. 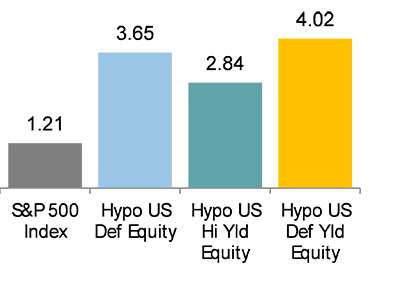 The Hypothetical US Defensive Equity portfolio: follows the Hypothetical US Defensive Yield Equity Portfolio construction including hedge and carry penalty, but is based only on return volatility, not sustainable yield or earnings stability. 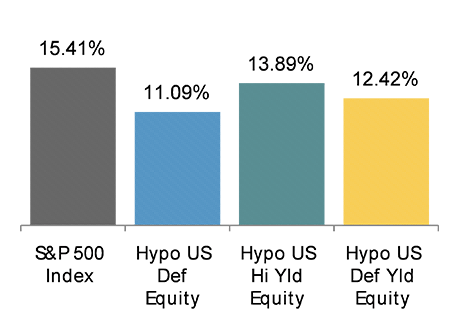 The Hypothetical US High Yield Equity portfolio: follows the Hypothetical US Defensive Yield Equity Portfolio construction process including hedge and carry penalty, but is based only on yield, not sustainability or return volatility or earnings stability. Hypothetical performance results are inherently limited and should not be relied upon as indicators of future performance. The hypothetical returns benefit from the use of hindsight, do not represent actual recommendations or trading, and may not reflect material economic and market factors. The results presented should not be considered a substitute for the investment performance of an actual portfolio. No representation is made that any account will or is likely to achieve returns similar to those presented. The hypothetical returns are unaudited. Past performance is not indicative of future results; current hypothetical performance may differ from that shown in this presentation. Total returns for the hypothetical results presented herein do not reflect actual investor returns. The back-test returns are in US dollars and gross of withholding taxes. Dividends are reinvested and were incorporated into the back-test. Transaction costs were incorporated into the back-test and estimated based on turnover: starting in 1973, 45bps ramped down linearly to 15bps by end of 2001, remaining steady at 15bps to present date. Actual trading costs may be higher or lower than this estimate. The hypothetical results do not reflect the deduction of investment management fees or certain other expenses. If such fees and expenses were deducted, the results would be lower. For example, if an account appreciated by 10% a year for five years, the total annualized return for five years prior to deducting fees at the end of the five-year period would be 10%. If total account fees were 0.10% for each of the five years, the total annualized return of the account for five years at the end of the five-year period would be 9.89%. Fees are described in Part 2A of QS Investors’ Form ADV. The value of investments and income arising therefrom can fall as well as rise, and no assurance can be given that the investment objectives will be met or that an investor will receive a return of all or part of his or her investment. Past performance or any prediction or forecast is no guarantee of future results. The views expressed in this document constitute our judgment at the time of issue and are subject to change. No representation or warranty is made as to the efficacy of any particular strategy or the actual returns that may be achieved. In preparing this presentation, we have relied upon and assumed without independent verification, the accuracy and completeness of all information available from public sources. We consider the information in this update to be accurate, but we do not represent that it is complete or should be relied upon as the sole source of composite performance or suitability for investment.